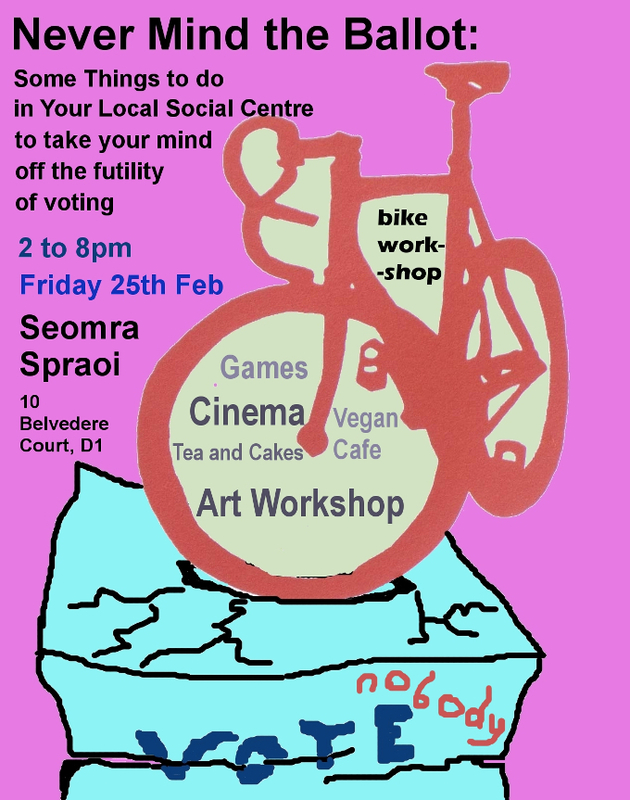 Fundraiser for Dublin’s autonomous social centre, Seomra Spraoi. Pay What You Like Admission. Should be a wonderful night so come on by! Are you involved in a campaign in your community? 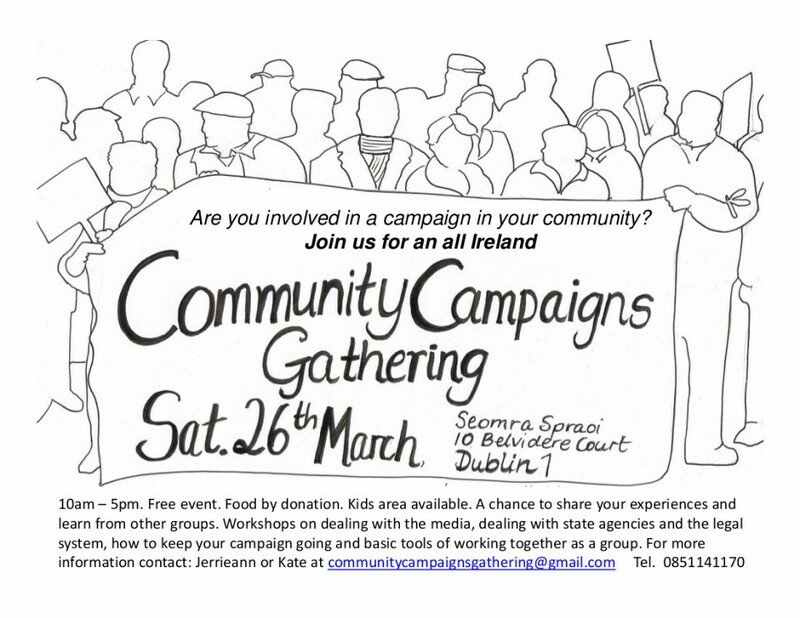 Join us for an All Ireland Community Campaigns Gathering in Seomra Spraoi. This is a free event. Introduction to the day and a chance for groups and individuals to introduce their own local situation and to hear some reflections from other campaigns. Share experiences of dealing with the media and get practical advice on writing and sending press releases, preparing for radio interviews and using alternative media. With Mimi Doran and William Hederman. Mimi Doran is a communications practitioner and media lecturer with interests in social justice and participatory approaches to learning, research, and communication. Mimi has completed research on media literacy with St Michaelâ€™s Estate Regeneration Team, at the Equality Studies Centre. Mimi has provided strategic planning, PR strategies and professional media training to a variety of businesses and organisations. William Hederman is an activist, photographer, graphic designer and journalist. He worked as a journalist and editor at The Irish Times and subsequently as a journalist at Village Magazine. He has also lectured in journalism at DCU. He is part of the collective that runs the Seomra Spraoi social centre in Dublin. Share your experience of working together in a community campaign group and learn basic tools that can be used to make decisions, facilitate discussions and keep working effectively. A chance to hear about the experiences of one community campaign group in dealing with state agencies, government departments, the legal system and the Gardai, and to share your own experiences that others may be able to learn from. With Eoin O’Leidhin, activist at Rossport Solidarity Camp. Eoin has been living in Mayo for the past four years and will be sharing experiences of engaging with state agencies, regulators and the legal system. Facilitated by Mark Malone, Seomra Spraoi. This workshop is a space to look at how community organisers can cope with mental and physical stress of long term campaigning, how we can support each other and keep campaigns going in a sustainable way for our communities. A chance to hear what people got out of the day to discuss how can we support each other and act in solidarity in the future, with the option of creating a short statement expressing solidarity between the different community campaigns for media release. The event is being organised by people active in a number of different campaigns including supporting the community under threat from Shell in Mayo. This event will be a neutral space and the aim is to support each other and share strategies. It is not a space for winning people over to specific campaign agendas or any party political groups. Discussions and learning from the day will be gathered and disseminated online to participants other community campaign groups after the event. 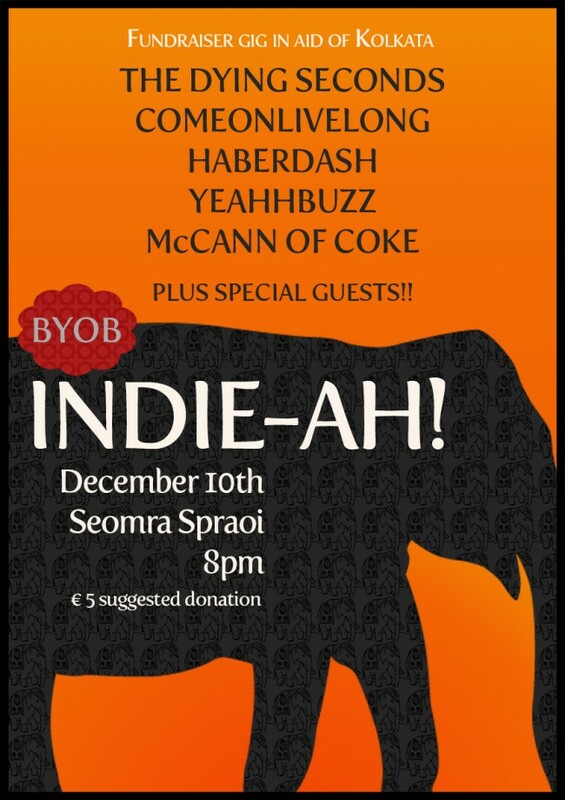 Venue: Seomra Spraoi, 10 Belvidere Court, Dublin 1. Seomra Spraoi is an inspiring example of a community centre run entirely on donations. Directions: Walk north along Gardiner St, past Mountjoy Square and turn right at the next laneway (Belvedere Court). Seomra Spraoi is about halfway down the lane on the right hand side (number ten). Food will be by donation, 5 euro or what you can afford. Please contact communitycampaignsgathering@gmail.com if you have any special dietary or mobility requirements. Let us know if you will need child care for the day as this can be arranged at the venue. Please contact communitycampaignsgathering@gmail.com or call Jerrieann or Kate (087 6686644 / 085 1171140) if you have questions, are interested in attending or to book a place. Food action invites you to â€˜Seed swapâ€™, a family friendly event. Swap trees, plants and seeds with Dublin’s growing community. Also enjoy the wholefood vegan cafÃ©, music and more. There will be a wild food and herb walk starting at Royal Canal, Phibsboro Road (next to Kelly’s Carpets) from 12:30amâ€“1:30pm. Seomra Spraoi will be open from 2pmâ€“6:30pm for the seed-swapping event & more! Vegan Cafe, Bike Workshop, Games, Cinema, Tea and cakes, and Art Workshop. Activities are by suggested donations. More if you can afford it, less if you can’t. A 1999 American comedy film adapted from a 1998 novel of the same title by Tom Perrotta. The plot revolves around a three-way election race in high school, and satirizes both suburban high school life and politics. Bill McKay is a candidate for the U.S. Senate from California. He has no hope of winning, so he is willing to tweak the establishment. Themes of the film include how the political machine corrupts and the pointlessness of politics. Doors open at 9pm, and it runs till 2:30am. Doors will close at midnight or when we reach capacity (circa 150 people), so please come early to avoid disappointment. Fundraiser gig to raise money for Loreto Sisters Sealdah, Christian Brother’s, Goal and Mother Teresa’s Sisters all based in Kolkata, India. Kicks off at 8.00pm sharp in Seomra Spraoi. BYOB event, â‚¬5 suggested donation at the door. 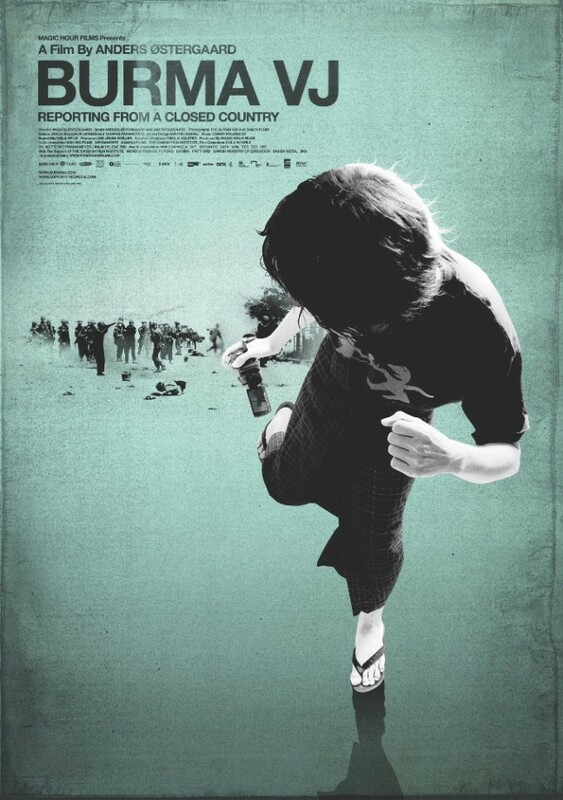 â€˜Burma VJ: Reporting from a Closed Countryâ€™ is a 2008 documentary film directed by Anders Ã˜stergaard. It follows the September 2007 uprisings against the military regime in Burma. Some of it was filmed on hand-held cameras, and the footage was smuggled out of the country. Other parts of it were reconstructed, which caused controversy. 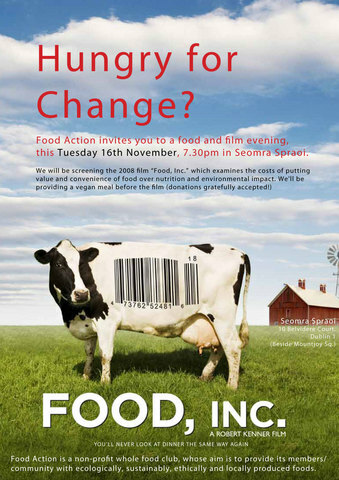 Food Action invites you to a food and film evening, this coming Tuesday 16th November, 7.30pm in Seomra Spraoi. We will be screening the 2008 film â€˜Food, Inc.â€™ which examines the costs of putting value and convenience of food over nutrition and environmental impact. We’ll be sharing a vegan meal before the film (donations gratefully accepted!). Food Action is a non-profit whole food club, whose aim is to provide its members/community with ecologically, sustainably, ethically and locally produced foods. 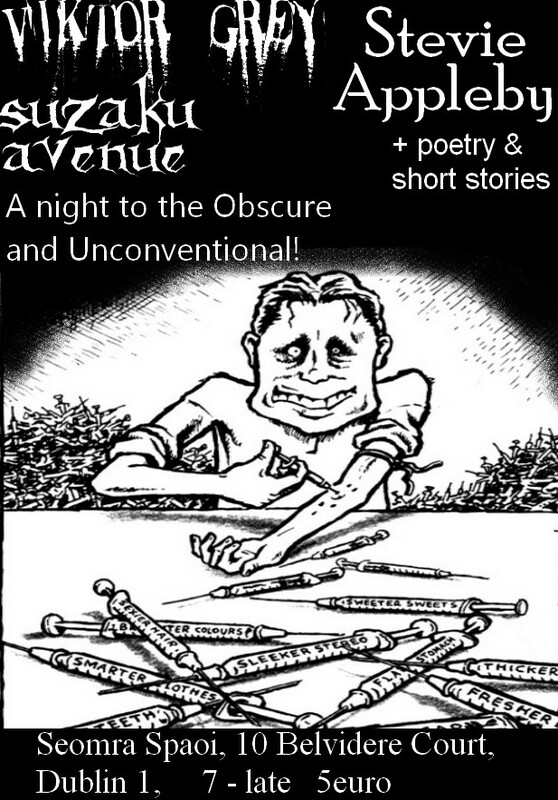 Live bands, a mix of acoustic and gothic alternative, aswell as prog music, the sickly and dark underbelly of the Dublin scene, a requiem to the obscure and unconventionalâ€¦ with strobe lights. The film is about two working class women, Isa and Marie. Isa is a drifter and searching for a lover she had met during the summer. When she realizes that her search for him is futile and turns elsewhere she meets Marie, who lives in a small French town near Lille. The two young women instantly find a connection as they both have been treated harshly by life and are living from day to day in short-time jobs, such as working in a textile factory or delivering leaflets in the streets. Marie lives in an apartment that she is looking after because the owners had a car accident in which everyone died, except for Sandrine, a teenager, who is in a coma. Marie invites Isa to live with her. Shortly thereafter Isa and Marie meet up with two bouncers, Fredo and Charly, whom they befriend. The men help them out and they have genuine fun together, although they are not much better off than the women.